This may sound cheesy, and well fair warning it is, but I feel like the luckiest girl. Being with Peter, having him be River’s father is something I am so proud of. I couldn’t of asked for a better partner to help me raise and nurture that sweet girl. He’s so active in her life and his love for her goes deeper than my understanding. Early Sunday morning I was awoken by a rambunctious River. With much excitement she grabbed her woody doll and started jumping on our bed chanting for us to wake up. I rubbed my eyes and proceeded to usher her out of the room to give her papa some extra rest. Peter and I decided from now on the best gift is a good few hours of uninterrupted sleep… and that’s what he got. While P caught up on some rest, River and I played, danced to some new records, and ate breakfast. Around 10:30 am a certain little lady wouldn’t take no for an answer and insisted on waking up her papa with a homemade card. That’s when the tears started to roll. I am a true water head, that is for certain. Once again, River jumped on the bed, pulling the cover from his face and showered him with kisses; placing the purple homemade card on his bare chest. Peter, mostly asleep, and with the groggiest voice said thank you and said how special he felt. If that was any indication of how they day was going to be, I’d better grab some tissues, foundation, and a compact mirror. Really, I am the sappiest lately. As we headed to the train for an afternoon spent in Williamsburg Peter was greeted with “Happy Father’s Day man!” from many of our neighbors. With the biggest smile he said thank you and continued to walk hand and hand with a dancing, singing River. In that moment, I felt the pride he also had. He often expresses how blessed he feels to be alive and have a family, but it’s one thing for me to feel it without him saying so. To have his pride and happiness radiate on a busy sidewalk, amongst other families and city noise is something I will forever cherish. I went into motherhood and expected nothing from Peter, and he has shown and given everything. Everything. It is pretty extraordinary how much one can love a man once she sees him as a father. 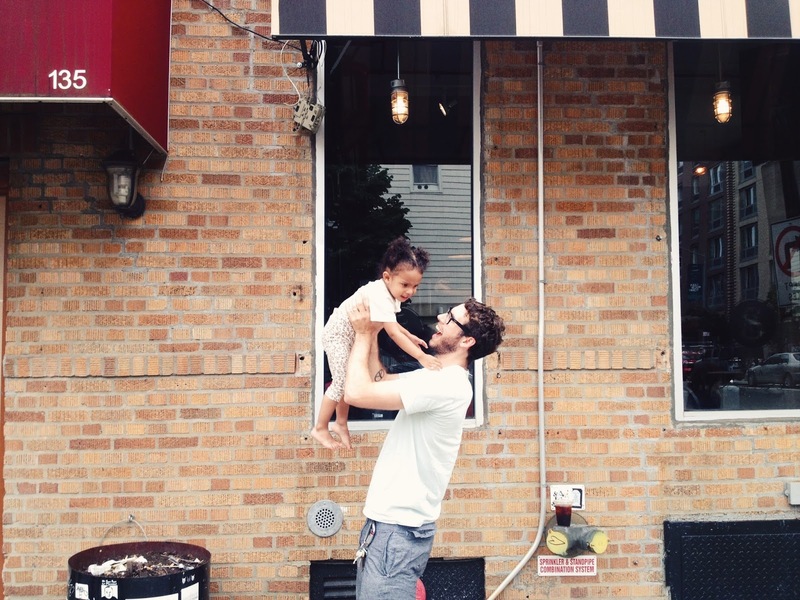 I love you P, you make fatherhood look easy as pie.